Black and grizzly bears (known locally as brown bears) are abundant in Alaska, British Columbia, the mountainous west of Alberta, and the Yukon. You're likely to glimpse bears on extended trips in these regions, whether in national parks or along the road. Extended and safe bear viewing, however, is best at locations where bears have become habituated to human presence, and / or where viewing facilities allow you to watch bears at close range. This page provides basic information about some of the best bear viewing locations in Alaska, along with photos, video and longer descriptions of sites I've personally visited. A map of some of the best places for photographing bears in Alaska and Canada. Click on the icons for basic access and permit information for these locations. The large icons show half a dozen of the best-known and developed locations (mostly wildlife sanctuaries, National Parks, or Forest Service observatories), while the smaller icons show sites that are either less developed (take care! ), less well-known, or even more remote. With just a couple of exceptions - Steep Creek in Juneau and Fish Creek outside Hyder on the British Columbia border - you can't drive to any of these places. You'll either have to charter a small plane (easy though not cheap in Juneau, Anchorage, and many smaller Alaskan towns), or take a commercial tour by air or boat. The Anan Wildlife Observatory is on the Alaskan mainland 30 miles south-east of the town (and island) of Wrangell. 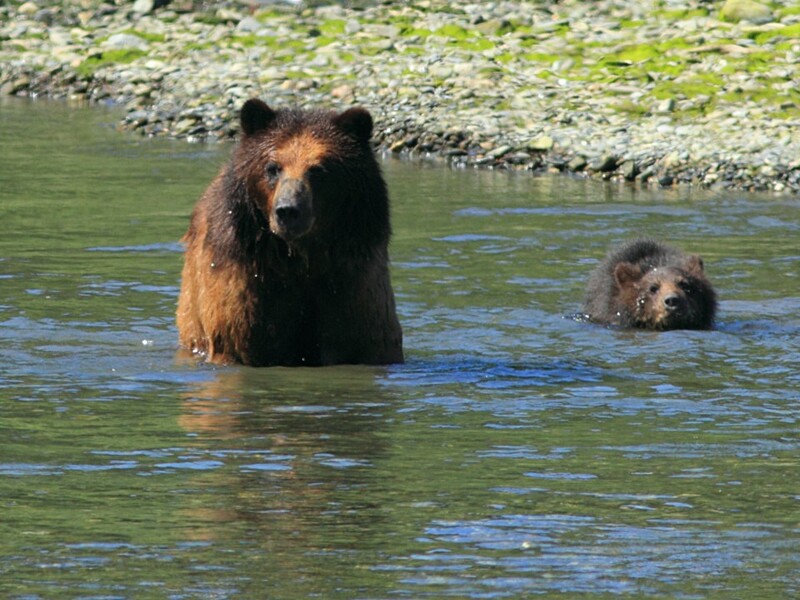 Bear viewing at Anan Creek coincides with the run of pink salmon, and is best between mid-July and mid-August (permits are required July 5th through August 25th). The Observatory has a viewing deck overlooking the creek, a covered shelter which could come in handy in bad weather, and a hide at water-level that you can sign up for in thirty minute blocks. Forest Service staff are on hand to orient you at the trailhead where float planes and boats land, and at the viewing deck, but you're on your own for the brief half-mile walk along boardwalk between the two. There's also a Forest Service cabin at Anan Bay, and staying here would definitely be the best way to experience the site. Reservations, as you might imagine, are hard to come by though! This whole stretch of south-east Alaskan coast is mostly uninhabited wilderness, both on the mainland and on Etolin, Kuiu and other islands offshore. Wrangell is the closest base for a trip to Anan Creek, and several companies there offer commercial tours by float plane or jet boat. Permits are limited, so booking ahead is highly advisable if not always required (during our visit, in early August, there were still some tour spots available). We wanted longer at the site than the tours offer, so we reserved permits independently through the February lottery and chartered a plane through Sunrise Aviation. It's also possible to fly from Ketchikan or Petersburg (which is mid-way between Anan Creek and Pack Creek, if you wanted to visit both sites) or to arrive independently by boat. There's no access from the mainland. Wrangell is much smaller than Ketchikan - no cruise ships stop there - and accommodation and "touristy" things to do are somewhat limited. There is one great hike on the island - a strenuous march to the High Country Shelter for great views of the surrounding islands - and in addition to the bear viewing there are regular boat tours up the Stikine River. I found Wrangell quite charming, but it's a destination for a few days rather than a long vacation. Anan Creek was the third of the top bear watching locations my brother and I visited, and nothing quite compares to the first thrill of seeing a bear splashing through the river at Fish Creek. Objectively though, Anan Creek is the easiest among the places we've visited for taking photos, and the best in terms of virtually non-stop action. While we were there, bears were visible at fairly close range almost all of the time, with only maybe one hour-long lull around mid-day. Black bears are the staple at Anan, though we saw a couple of browns including one who arrived at the fishing site via the trail! Fishing seems pretty easy here, at least in the prime spots near the waterfall, so there's not too much splashing around - when a bear wants a fish it pretty much snares one right away. There are many possibilities for seeing multiple bears at the same time, or interesting interactions between mothers and cubs. The only negative is that the number of Anan Creek permits issued each day is quite large (60), with most of those going to tour companies whose clients spend only a fraction of the day on site. It's not crowded, but there are plenty of people coming and going. So it didn't feel quite as wild and pristine an experience as our visit to Pack Creek, which we shared with the same group of people all day. 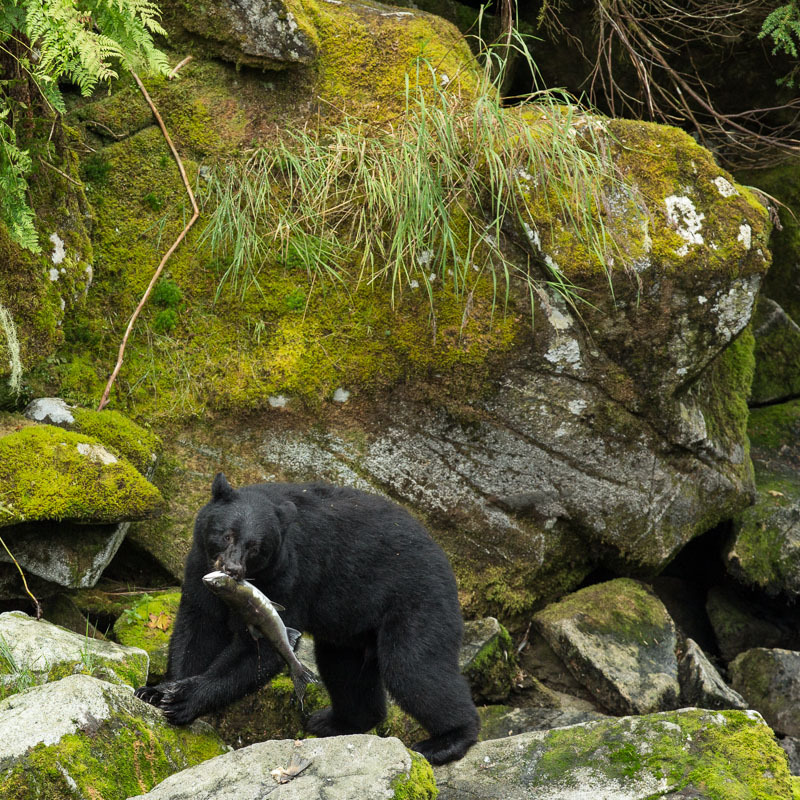 Anan Creek is a relatively easy location for capturing good images of bears fishing. There are two viewing locations, the main observatory which looks down on the waterfall and creek (and across to the wooded slope on the other side), and a hide at water (and bear-eye) level just below the falls. Bears are generally quite close while fishing, and when they're not fishing you probably want a wider shot to show the environment of rocks, caves and logs that is characteristic of Anan. From the observatory deck, 300mm or 400mm on a full-frame camera work well, probably on a monopod as the angle is a bit awkward with a tripod. From the hide, a 70-200mm lens is about right. We visited on a mostly overcast but fairly bright day, and typical exposures were something like 1/1000s at f/4, ISO 800-2000. That's nothing problematic for any modern camera. I imagine it can get much darker, though, and it's definitely best to go fully prepared for rain. 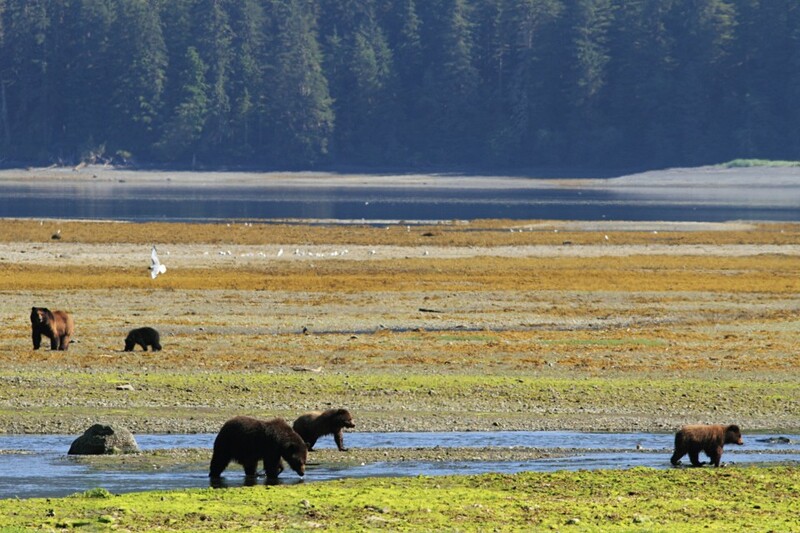 The Pack Creek Brown Bear Viewing Area, run jointly by the Forest Service and the Alaska Department of Fish and Game, is on Admiralty Island, off the Alaskan coast near Juneau. There are no black bears on the island but brown bears are thick on the ground, with a density averaging one per square mile. It's with good reason that the native name for the island, Kootznoowoo, translates to "Fortress of the Bears". 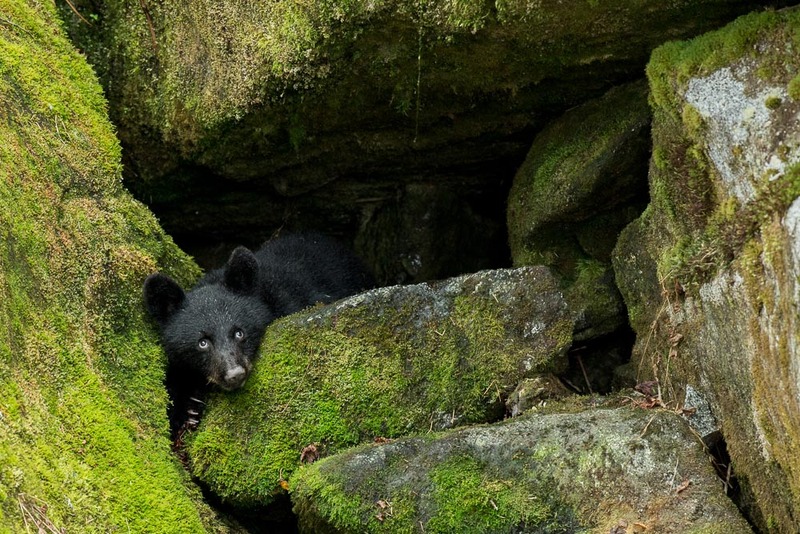 Most of the island is open to hunting, but the Pack Creek bears are both protected within the Stan Price wildlife sanctuary and well-habituated to human visitors, who have come to this spot to see bears for more than half a century. The main attraction of bear viewing at Pack Creek is the supremely wild and unspoilt environment. Admiralty Island is only 15 miles from the Alaskan capital, Juneau, but there is no regular ferry or air service to the sparsely populated island. We booked Pack Creek permits independently, and chartered a float plane giving us a full day (9am through to 5pm) at the site. Several air taxi operators are licensed to fly to Pack Creek; we went with Ward Air and were very happy with their service. It's also possible to visit as part of a commercial tour, either by plane or by boat. A group led by Captain Kevin Smith from Maple Leaf adventures were there with us, and seemed to be enjoying themselves. If you want to stay for more than a day, camping is available on a small island just a few hundred yards offshore. You'd need a kayak or other boat if camping, but there are several ways to schlep one over: you can either paddle directly from Juneau (only for the experienced), get a boat to drop you off at Oliver Inlet (from where it's an easy and popular kayak trip along the Seymour Canal to Windfall Island and Pack Creek), or strap it to a plane. 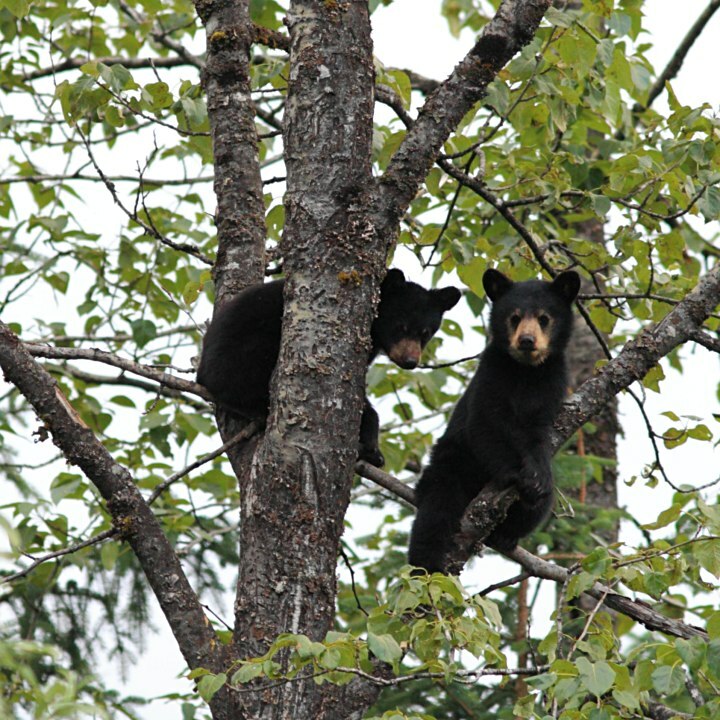 There are two main locations for bear watching at Pack Creek, a viewing spit at the mouth of the creek, overlooking the tidal flats beyond, and an observation tower reached by a short trail back in the forest. Visiting in late-July, we spent the entire day at the spit, watching as many as half-a-dozen bears at any one time fishing for salmon or walking out on the tidal flats. The bears seemed generally tolerant of each other's presence, and paid us viewers little attention. 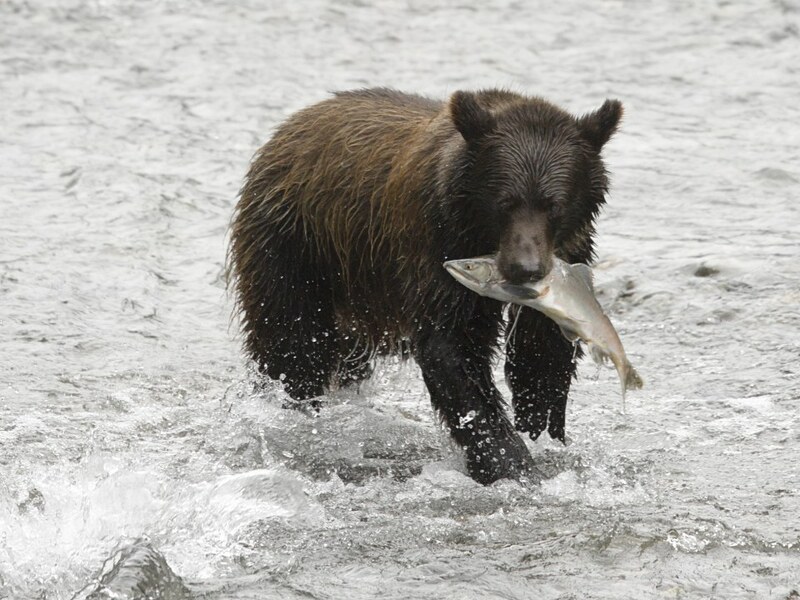 In the peak season of July and August salmon is the lure, but earlier in the season you might see bears digging for clams or other shellfish at the site. Countless eagles and flocks of sea birds were also there. The short version is bring the longest glass you can afford. Bears may approach very close, either at the viewing spit, or while you're walking along the beach or the trail to the observation tower. Typically, however, you will need a lot of reach to capture close shots of bears fishing. The photos above are moderate crops from a 300mm frame on an APS-sensor camera. The good news is that the viewing spit area is quite well-lit, so fast lenses are desirable but not essential. We were fortunate enough to visit on a rare sunny day, but that meant that there was a noticeable heat haze over the gravel bars that made long shots problematic. The Fish Creek bear viewing observatory, run by the US Forest Service, is the easiest of the premier bear watching locations to visit. It's a few miles outside Hyder, Alaska, with good road access (paved on the Canadian side) from British Columbia via Highway 37 / 37A. Bear viewing here is best between mid-July and September, with the peak of the salmon run typically occuring sometime in early to mid-August. Permits are sold at the gate, but there's no quota. I'd recommend staying in Stewart, British Columbia (my brother and I stayed at the Ripley Creek Inn, which is very pleasant) and driving to the site for dawn and dusk each day. Have a look around before you get out of your car, as bears are thick on the ground here and brazen enough to head to the creek via the parking lot. There's no border control entering the US in Hyder, but you'll need a passport to re-enter Canada. We experienced no problems taking our rental car back and forth across the Canadian border. Bears in the Fish Creek parking lot! The rhythm of a day watching bears at Fish Creek follows a fairly predictable pattern, with the action being best early in the morning (plan on being there as soon as the site opens, at 6am Alaska time) and in the couple of hours before dusk. Even during these peak hours, bears are not always visible. One waits on the boardwalk for a bear to appear, typically from down stream, and then watches as it moves along the creek past the viewers. 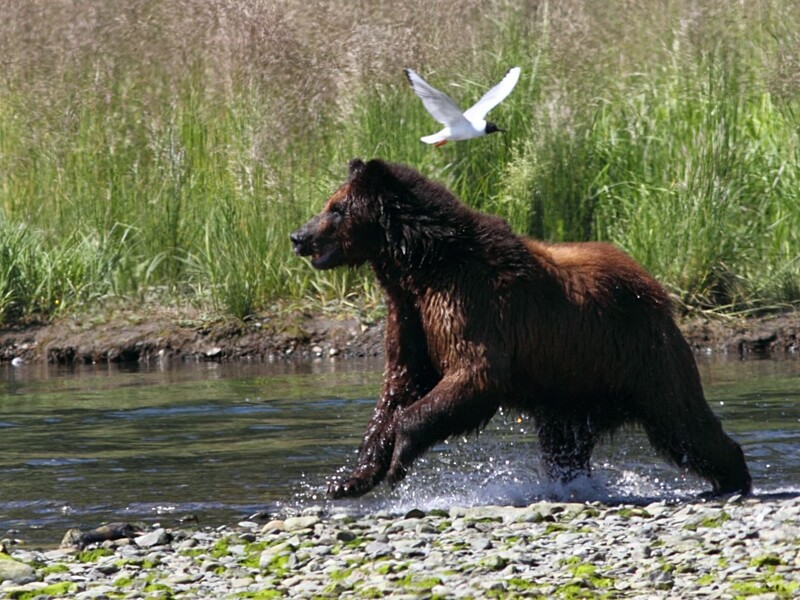 When a bear catches a fish, it may boldly eat it on the bank or retreat out of sight into the undergrowth with its prize. 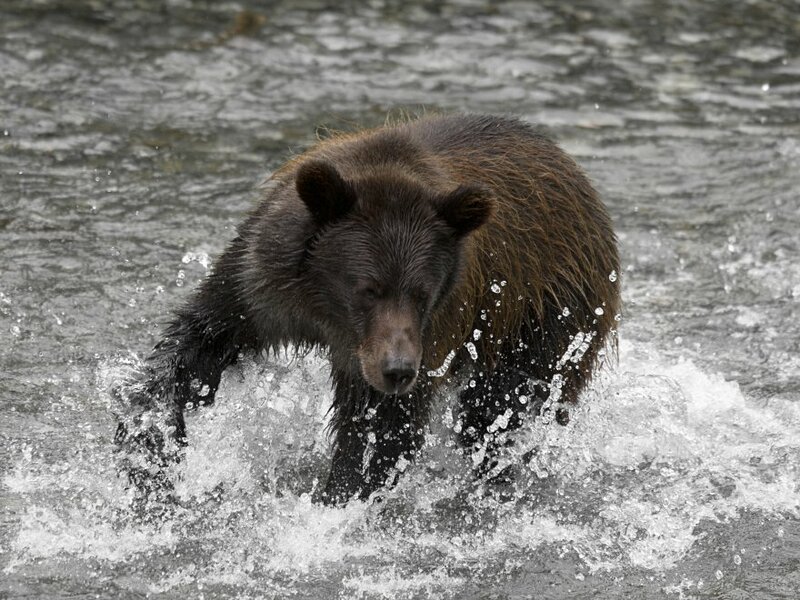 For adult bears there's not too much drama involved, whereas with youngsters there's plenty of enthusiastic splashing through the water and lots of near misses before they snare a salmon. Occasionally you may see unrelated bears show up at the same time - when this happened during our visit all three bears (a mother and cub, and an interloper) rapidly disappeared into the forest after which some blood curdling bellowing ensued. 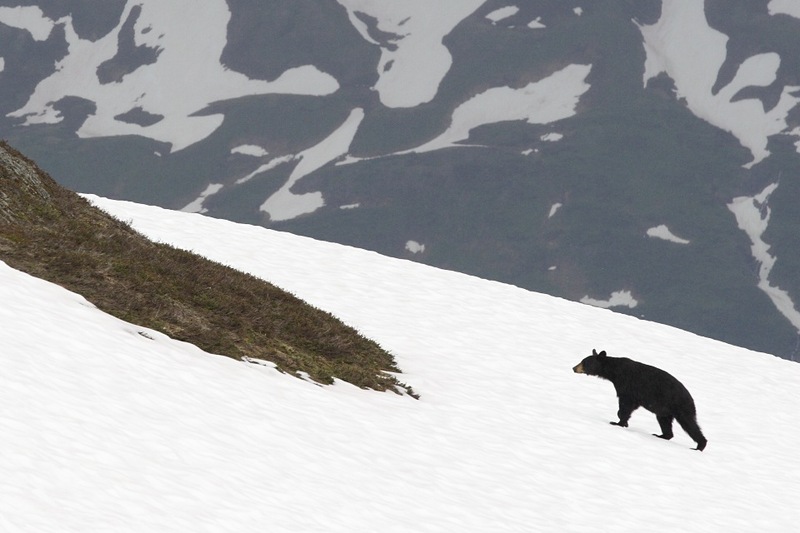 Black bears are warier, but may be seen when there are no grizzlies around. 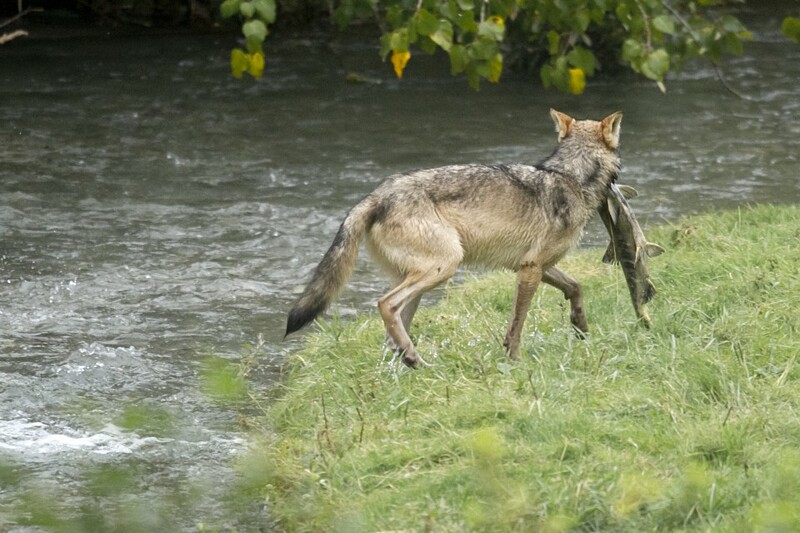 Eagles frequently show up to scavenge on the left overs, while wolves are also possible visitors. We had the amazing good fortune to see a lone wolf - pictured above - late one night after the bears, and almost all of the visitors, had left. The wolf was just as skilful a fisherman as the bears, and we watched as he caught a huge salmon before vanishing into the dense undergrowth. Bears pass very close to the viewing platforms at Fish Creek, though normally you'll be looking down and it's not so easy to get an eye-level perspective. Good images can be made with any camera. With an SLR, focal lengths of about 500mm (full frame) are probably optimum. On occasion that will be too much lens but often it will be about right. The main challenges at Fish Creek are the light and the weather. Expect it to be gloomy, especially in the evenings, when a fast lens and high ISO are essential. Rain, possibly of biblical proportions, is very likely. Rain covers for your equipment are essential. Steep Creek is a Forest Service fish viewing site, with runs of sockeye and coho salmon that start in mid-July and continue into October. With the salmon come bears - most commonly black bears though there are also grizzlies in the area - which can be seen from late July into September. The site is exceptionally easy to visit; it's adjacent to the Mendenhall glacier visitors' center about 10 miles from downtown Juneau, and there are no permits, fees or restrictions on visitation. There's a short loop trail, of about 1/3 of a mile, part of which forms an elevated boardwalk. Visiting Steep Creek in late July, just after the salmon started spawning, we (and a large crowd of other tourists) saw a family of black bears fishing in the late evening. Returning at 6am the next morning the crowds were gone, and although we lucked out on seeing any bears either this is probably the best time for viewing and photographing bears at the site. 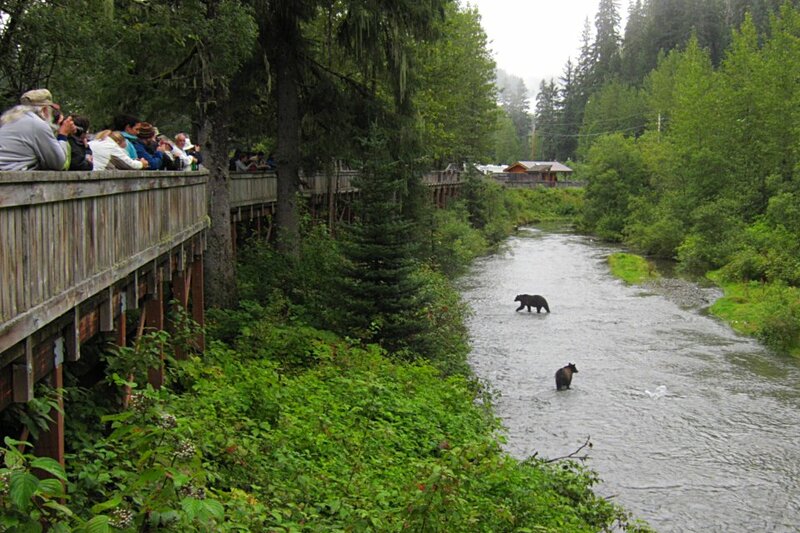 Unlike the wilderness bear viewing sites described above, Steep Creek is right next to Juneau's main tourist attraction and only a mile or so from dense residential development. Bears brazen enough to visit here are very likely well-habituated to human presence, and can be seen walking under and around (hopefully not on) the viewing platforms. For photography the flexibility of a zoom, perhaps in the 100-300mm range, would be helpful to allow for both environmental shots and portraits in the event that a bear comes very close. (I failed to get a good picture of the bear cubs' mother, who was too close for an image with a fixed 300mm telephoto.) Part of the trail overlooks the lake below the Mendenhall glacier, so the unique image you can hope for is one of icebergs from the calving glacier as a backdrop. There are also some attractive pools and areas where the trail overlooks dense undergrowth, and with some luck those might also offer an interesting setting. Black and grizzly bears can also, of course, be seen and photographed elsewhere. In the lower 48 states, healthy numbers of grizzlies inhabit Montana's Glacier National Park and Bob Marshall Wilderness, and Yellowstone National Park in Wyoming. 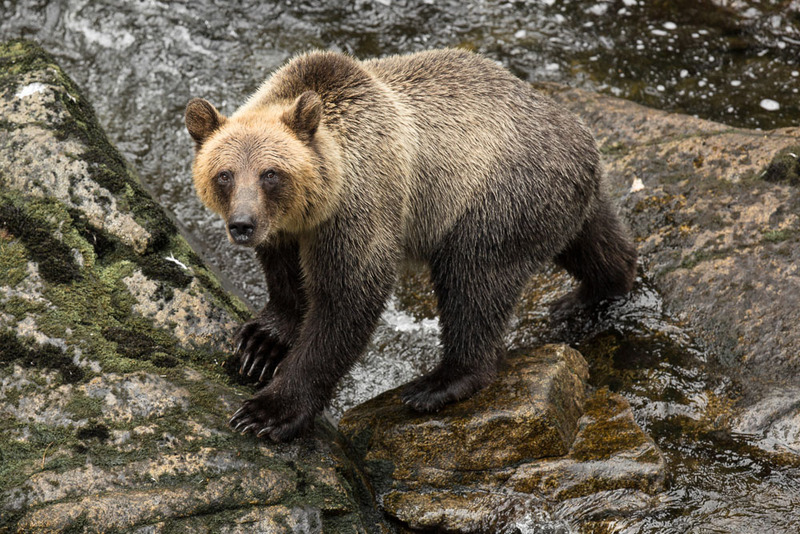 North of the border, grizzly bears can be seen in all of Canada's mountain parks, in the Yukon, and in Alaska. As for black bears, they can be found almost everywhere in both the east and west of the US and Canada. In my experience, sighting bears in the National Parks is largely a matter of luck, though chances are best if one's out and about in good bear habitat at dawn and dusk. I've typically seen grizzlies in open meadows or avalanche chutes. Black bears tend to inhabit forested regions, but seeing them there is hard - most of my sightings have been of bears foraging near (or crossing!) the road. 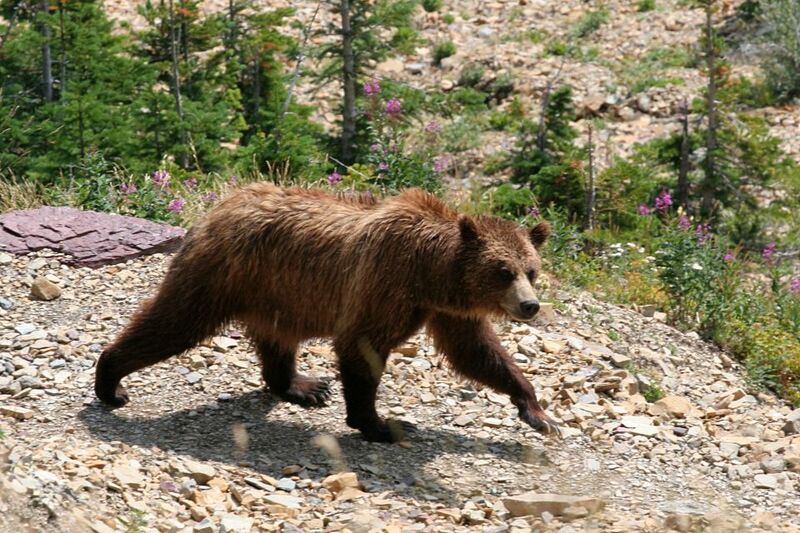 Personally, I've had the best luck sighting bears in Montana's Glacier National Park - which has a relatively large population of relatively habituated grizzlies in a small space - and along highway 37A east of Stewart in British Columbia. Other sightings have come in Alaska's Kenai Fjords (right hand picture above), Jasper, Denali (at considerable distance), and near the Yukon's Kluane National Park. Getting a good photo out of such encounters is hit and miss. If you spy a bear along the roadside, your best bet (for several reasons!) is to stay in the car and use your vehicle as a blind - bears are likely to pay less attention to a stopped car at close range than a human. If you instead encounter a bear, especially a grizzly, out on the trail, safety has to be paramount, and there will probably only be time for a few frames before the bear is gone. All of the above trips were taken with my brother. 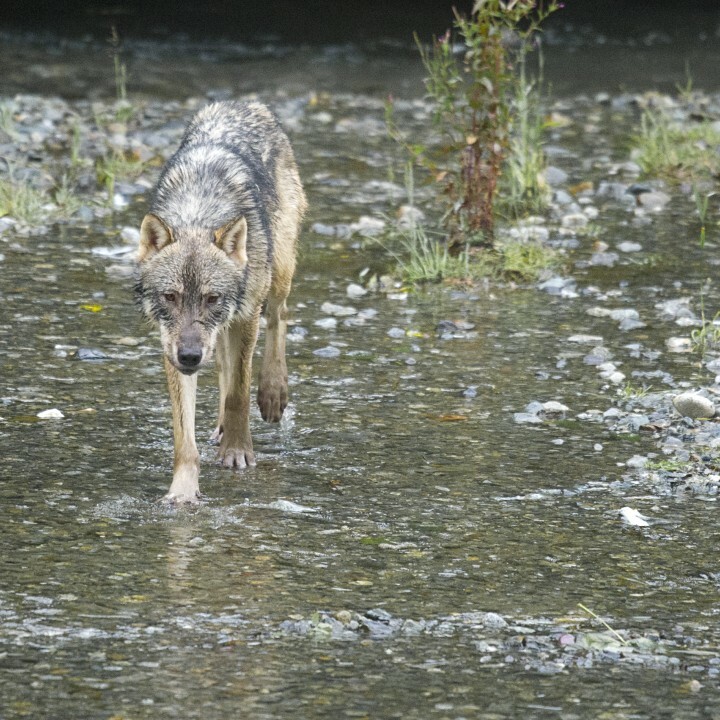 Check out his galleries of pictures from Anan Creek, Pack Creek and Fish Creek. 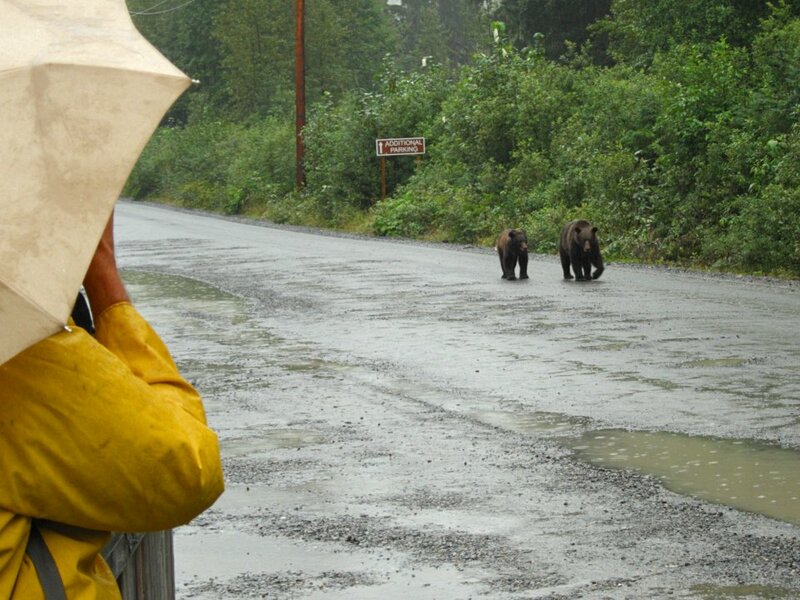 Bear Viewing in Alaska (Stephen F. Stringham, Kent Fredriksson). 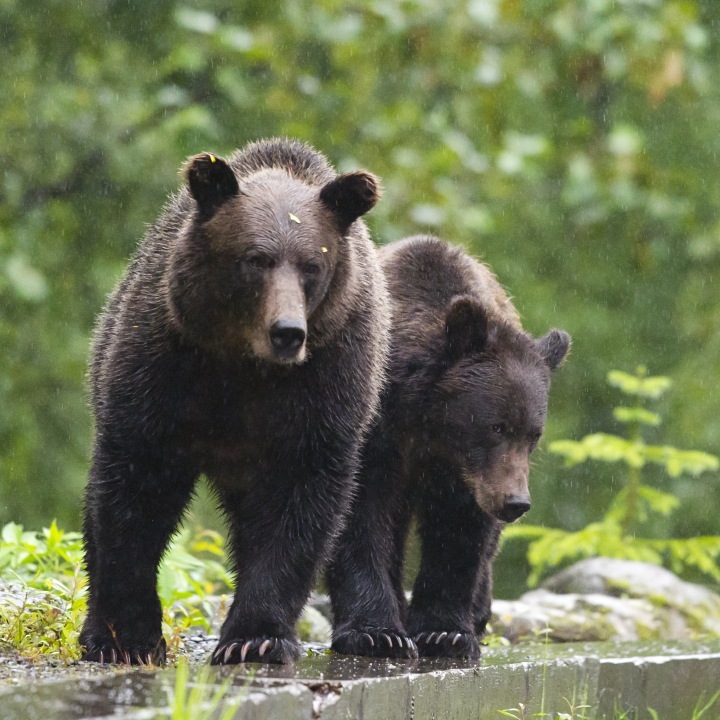 This is a short but useful guide to where to see brown bears in Alaska. The information and photos on this page are based on trips my brother and I took between 2011 and 2013, so some things may have changed since then! I'm no expert on bears - in real life I'm an astrophysicist who studies planet formation and black holes - but I'm happy to try and answer queries. Phil Armitage (pja@jilau1.colorado.edu).